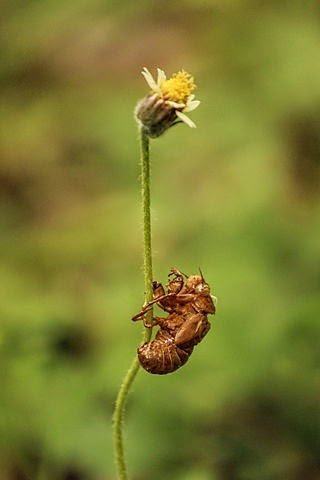 When I was a kid, we loved collecting cicada exoskeletons (see photo below). We'd find them clinging to the bark of the pine trees in our yard. I'd collect a jar full of them. I hadn't seen one in years until this past summer when I found one clinging to our chicken coop. One of my granddaughters wanted to scare my grandson with it. He didn't know what it was, so it got crushed on the ground. I guess I need to give some nature lessons the next time they visit.